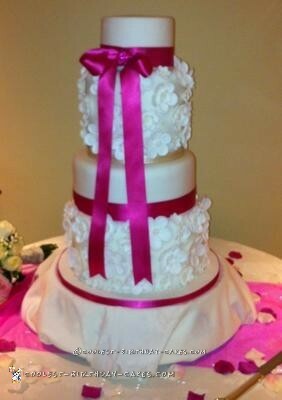 This is my 1st wedding cake and I was asked by my daughter to make this one for her special day. She gave me a picture of the design she had chosen. And the last tier was a 5” cake dummy covered in icing. I began by covering the cake dummies in icing placing one dummy on a 9” cake board and the other on a 5” cake board and left these to harden, and also made the flowers over the next few weeks I made the flowers using ½ flower paste ½ fondant icing. I rolled this out thin and using rose cutters in small and medium cut them out one at a time and thinned the petals out with a ball tool. These were then placed on a mould to give them shape. I went to the supermarket and asked if I could have the separator card from out of the apples, this is what I used to give my flowers shape when hardened. I placed the card upside down so they were like dome shapes and placed my flower petal on these to dry out. I measured around the 11” and 7” cake tins with paper also to the thickness of the cake I was doing so as the flowers dried I could place them on this paper to see how any flowers I needed and I did a few more. I also cut flowers out of different shaped flower cutters and on some of the flowers I doubled them up to give a 3D effect. To finish the flowers I squeezed some royal icing in the centre and placed 6 little pearl balls to make the centre of the flower. It was now time to bake the cakes I baked 3x 11” vanilla sponge cakes these were left to go cold and then covered in cling film, I then baked 4 x 7” lemon cakes and while they were still warm I poured a little of the lemon drizzle over them (this was a mixture of lemon juice and icing sugar.) These were then left to go cold and then covered in cling film individually. The next day I mixed my butter cream, I placed a blob on a `14” cake drum and filled the different tiers with butter cream and jam and then covered the whole cake in butter cream and this was then placed in the freezer inside a 14” cake box for 10 min mean while I started to kneed the icing until soft and pliable and started to roll it out when the cake was ready I covered the cake in the icing and left this in a cool place to harden. 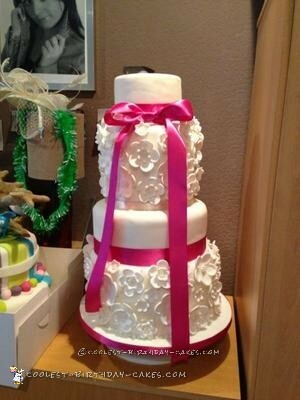 The cake was made in two pieces as it would be too heavy to transport. 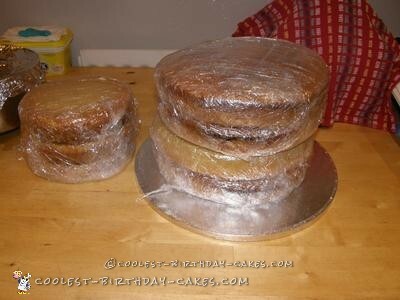 I started by placing 5 doweling rods in the centre of the 11” cake making sure they were all level with the icing. I then did the same with the next two tiers. 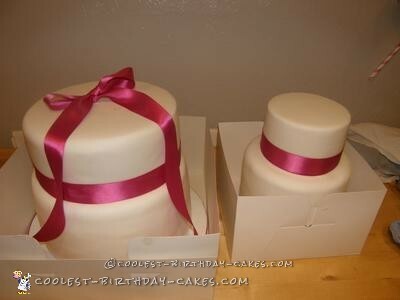 I then stuck the ribbon around the edge of the 14” cake drum, and the ribbon around the outside of the 9” cake dummy. I also placed the ribbon around the outside of the 5” cake dummy and then stuck the ivory ribbon around the edge of the 8” cake drum. Next I piped some small balls around the base of the 11” cake. My daughter and I then started to attach the flowers to the cake using royal icing placing them on one by one until filled. On the wedding day the cake was placed on a cake stand covered in a cloth the same colour as the table cloth and the top tier was placed on the last thing to do was to place the bow onto the top tier using 4 pins with deep pink stones. We were really pleased with the end results.